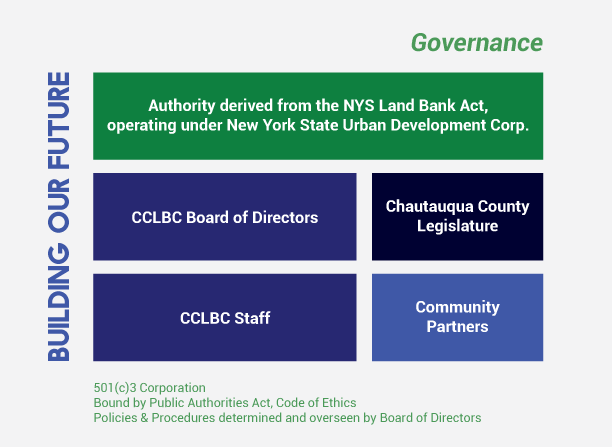 Authority of the Chautauqua County Land Bank Corporation is derived from the New York State Land Bank Act which operates under the New York State Urban Development Corporation. This authority grants us the opportunitiy to acquire abandoned, foreclosed or vacant properties in order to strategically reuse or dispose of them to responsible, new owners. If it weren't for the New York State Land Bank Act, the Chautauqua County Land Bank Corporation wouldn't be able to help develop the economy and community of Chautauqua like we do today. The board of directors of the Chautauqua County Land Bank Corporation work with the county legislature in order to properly acquire the properties, remove blight and generate tax revenue. Working hand-in-hand with the Chautauqua County legislature allows for our board of directors to have access to a variety of resources that wouldn't be available otherwise. The Chautauqua County Land Bank Corporation staff works side by side with community partners to create and plan goals for the community as a whole. Contact the Chautauqua County Land Bank Corporation to learn more about how we can work together.